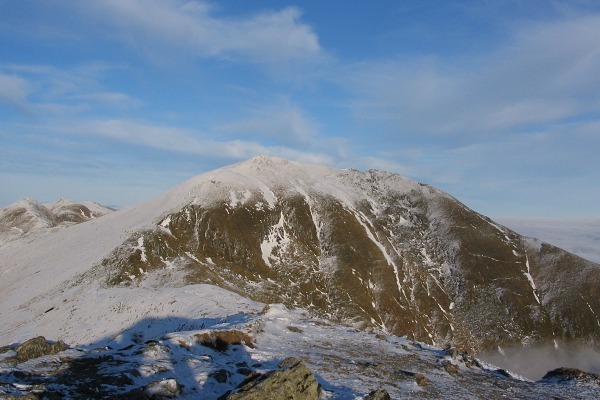 Ben Lawers is the highest peak of a long ridge formed by six peaks, five over 3000ft. This mountain is composed of four ridges, mostly grass with some rocky outcrops but the slopes between the S and W ridge are steep crumbling cliffs on which some of Britain's most beautiful alpine flowers grow. 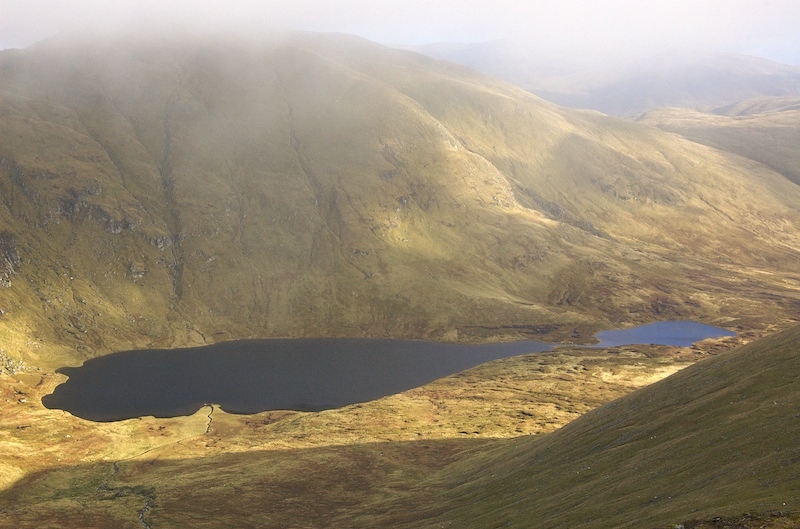 The short W ridge connecting to Beinn Ghlas and the longer N ridge to An Stuc are the normal ascent routes for Ben Lawers, although a direct ascent from Lochan nan Cat to the S is possible. 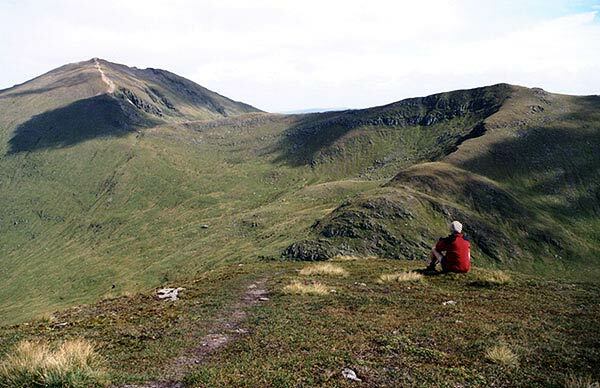 The most common ascent via Beinn Ghlas is a wide badly eroded path. Cold crisp February morning on Ben Layers! Beinn Ghlas with Ben Lawers behind, viewed from Meall Corranaich. 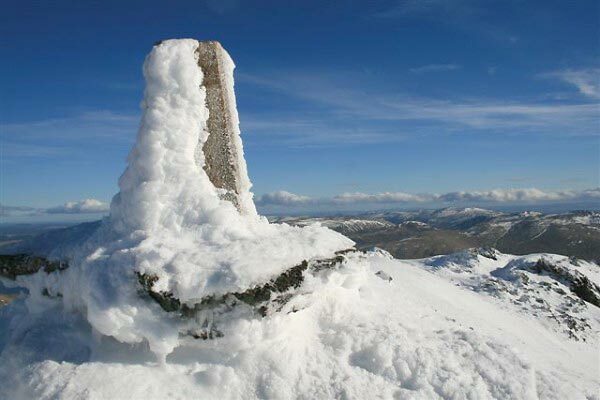 The summary information of one or more ascent routes that include Ben Lawers. 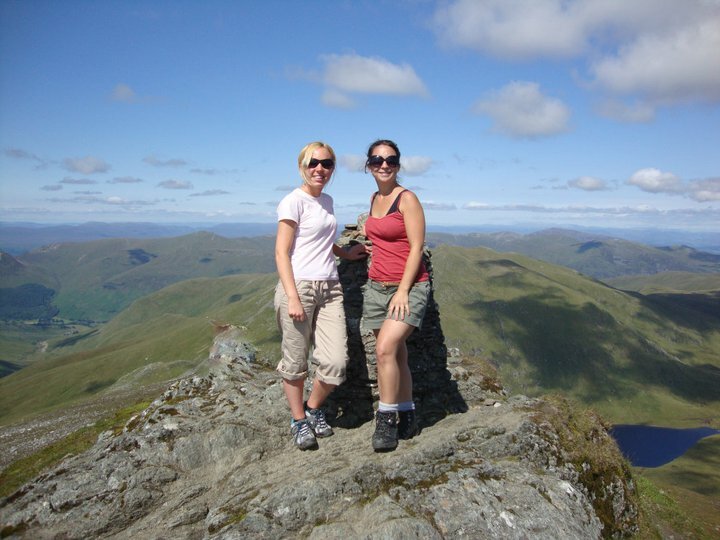 Post a few words about Ben Lawers or read what others have had to say. Showing the most recent 5 of 19 comments. Would you like to view all 19? Started from the car park and up to Beinn Ghlas via Creag nan Gabhiar.At this point it was getting very icy so on with crampons and out with ice axe.This always increases the boldness so decided to hack my way up 2 long and steep snow packs to the top of Beinn Ghlas.The connecting ridge to Lawers was also frozen solid and i worried for several folks including one group with 4 children around age 10 with no crampons on the connecting ridge.Over to Ben Lawers and up a nice steep ice slab, then re joined the main path to Lawers summit.Weather does its worst and a whilte out is on me.Battled to the top and back rapid before the wind chill froze me to the spot!Returned same route and the weather cleared again giving great views of most of the Munro`s in the area. Sunny with snowy patches. Climbed again with Lou, sunny but cloudy but views from the top. 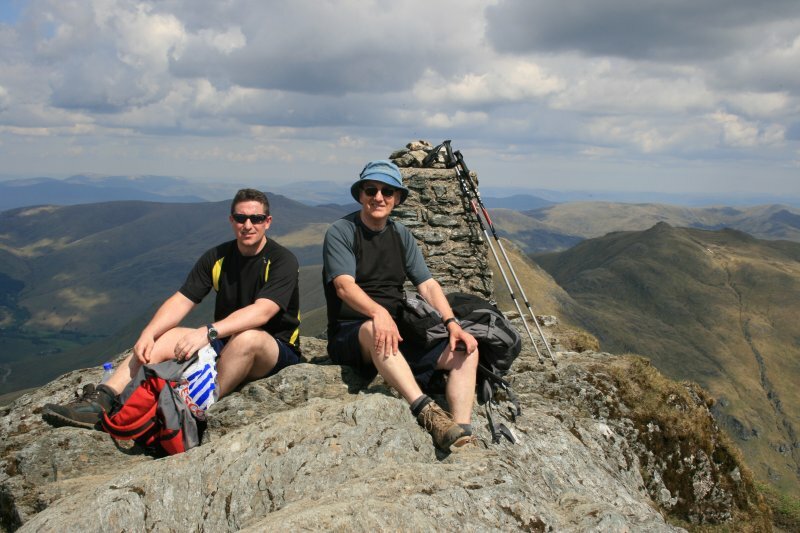 This was second time up hill as first climbed approx 9 years ago with my Dad, even though he cheated and went to BL on the low path and made me go via BG first. 19.09.09 climbed yet agin, plan B as meant to go up Meall Nan Tarmachan but due to mist headed up side path to BL first then over to BG. A lot easier that way and much more fun due to the three lads we met from E Kilbride who made us laugh all the way home, even in the mist and rain and taught us to 'point'. Climbed with my son on Friday 4/09/09. Weather very cloudy and very windy with 60 mph gusts but no rain. 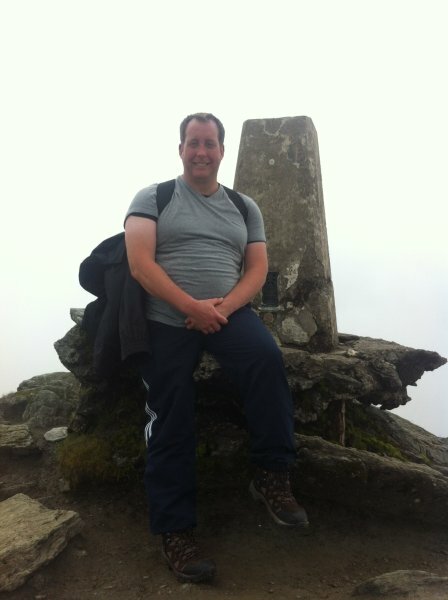 Climbed the Munro magic route from visitor centre above Loch Tay. The Centre is closed permanently now. Good path up to Beinn Ghlas which we reached in 1 hour 15 mins then onto Ben Lawers. The path to An Stuc bears left (North) at the 2 trig points. 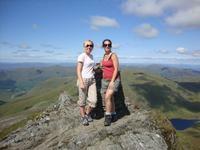 Fairly easy climb to An Stuc which we reached in 45 mins from Ben Lawers. Cloud lifted lower down. Had to return to Ben Lawers then descended to where the path branches and took the very easy path down the valley. 5 hours 15 mins round trip. Set out for what looked like being a beautiful day. The target was at least Beinn Ghlas and Ben Lawers, with the possibility of adding An Stuc and Meall Garbh should we feel up to it. The NTS car park was bathed in sunshine, so not really concerned about the clouds enveloping the peaks. Once we got towards the clouds though it became clear that the wind was going to pick up the higher we got. Soon we had only 20-30 metres visibility, but we found the first target, Beinn Ghlas after 90 minutes climbing. We continued upwards along the ridge to Ben Lawers, easily summited only 20 minutes or so later. We were pleased to find the summit was naturally sheltered from the wind, and we happily ate lunch in the company of several other climbers. On descent we got a close up view of a large group of deer. A pretty nice way to remember a climb which promised much, but delivered very little else.